Now how are you going to get it out? National Health Services (NHS) worker Kara Florish took to Twitter to document receiving a body-image shaming business card on London's Underground. 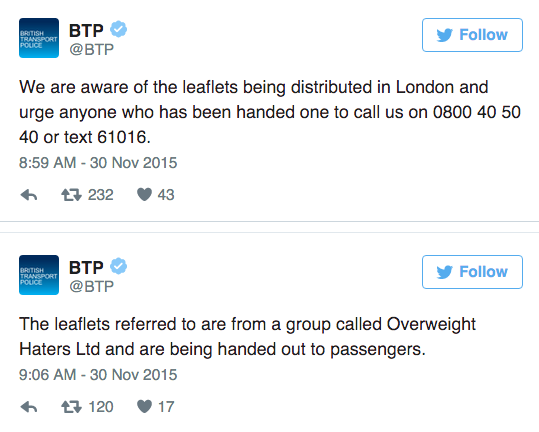 The card, which states to be from a group called "Overweight Haters Ltd", reads "fat" in large letters on one side. The other side contains a paragraph with a description of the "organization". Writer Sean Thomas Knox witnessed a similar, separate body-shaming card incident, and tweeted about it's authenticity. British Transport Police on Twitter are asking anyone with any information to get in touch with them. Keep it Simple, That's Our Motto!